Our uprights are customized to fit individual homes and cleaning preferences. 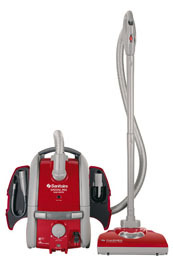 Each model combines a high performance vacuum with customized features that fit your needs. SYSTEM_PRO high performance canisters are designed to achieve professional-quality They feature sophisticated cleaning comfort and protection for your furniture and floors. SYSTEM_PRO's compact vacuums are versitile making it easy to clean floors, above floors and stairs. These lighweight vacuums are also very easy to store.